Our forearm muscles are frequently used throughout the day to lift heavy objects, drive, write, or type on the computer. Parents with young children realize how often they use their forearms throughout the day with childcare activities, especially with lifting the children or placing them in their car seat. Active parents often experience that tightness and dull pain in their forearms that increases with activity or exertion. The pain fluctuates based on their activity over several days. Many times the sore muscles improve and the pain disappears, while other times it leads to an injury. We commonly refer to the forearm muscles in therapy and treatment. The forearm muscles are actually a collection of many muscles that serve distinct functions within the body, such as flexing the wrist or extending the fingers. Many of the wrist flexor muscles start on the medial epicondylitis and extend towards the fingers where they cross the carpels or wrist bones. The wrist extensor muscles start on the lateral up condyle and run down the back of the forearm where they cross the wrist to attach on the hand. Throughout the forearm we also have smaller muscles that pronate and supinate the hand. A different set of muscles are responsible for radial deviation and our deviation movements. Another set of muscles extends to the fingers along for either finger flexion or finger extension. Injuries are common in the forearm with repetitive activities, whether at home or work. Activities that involve a firm grip and twist motion commonly injure the muscles and tendons. Likewise, ripping or pulling motions can damage the muscle fibers. Many times we overwork our forearms while performing our work activities, such as typing at the computer all day. Then we overexert ourselves in our weekend home, yard, or recreational activities that results in the development of an injury. The muscles were weak and tired from the work week, and the weekend was just too much for the soft tissue to handle. Home treatments for forearm muscle and tendon injuries involves ice, rest, bracing, or splinting. We try to reduce the workload on the muscles to allow them to heal. Ice and heat therapies help control the pain and inflammation in the muscles and tendons. Heat helps increase the blood flow, which brings more nutrients to help in the healing. Often times patients can buy specific braces or supports for either lateral epicondylitis or medial epicondylitis injuries. Injuries closer to the wrist often do better with hand or wrist braces that restrict the motions and movements. The forearm muscles are often the result of overexertion of the wrist flexors and extensors. Treatment and therapies are designed to decrease the spasms and injuries associated with the overuse motions. Lateral epicondylitis and medial epicondylitis respond very well to massage therapy. Massage therapy is working to decrease the muscle spasms and scar tissue between the large muscle bundles in these muscle groups. Massage therapy works from the shoulder to the fingertips, trying to improve the muscles of the entire upper extremity kinetic chain. Graston technique and active release technique are specifically designed treatments to break up scar tissue within the muscle fibers. Graston technique utilizes stainless steel tools sliding over the skin to develop sheer force and break up the scar tissue. 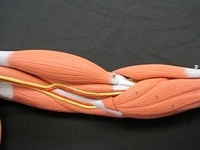 Active release technique produces tension and strain across the muscle fibers to accomplish much of the same outcomes between larger muscle fibers and bundles. Often the combination of massage therapy, Graston technique, and active release technique produces significant benefit to patients. Therapeutic modalities utilized to decrease pain, inflammation, and muscle spasms are traditional treatments in an office. The clinic will use electric therapy, ultrasound, stretching, and exercise to achieve these goals. Light exercises are slowly increased as the muscle fibers are able to handle the workload. Stretching the wrist flexors and extensors helps enhance the flexibility and improves our functional abilities throughout the day. One of the newest and most effective treatments for decreasing pain and inflammation in the forearm muscles is cold laser. We can utilize cold laser therapy or low level laser therapy on both the muscles and tendon attachment sites. Lateral epicondylitis and medial epicondylitis are notorious for producing significant pain and inflammation around the muscle tendon origins. Low level lasers help decrease inflammatory products being produced in these areas. In addition, the low level laser decreases pain sensation and activation, so you experience less pain during the day. Cold lasers also enhance cellular repair and regeneration mechanisms to accelerate healing and recovery times. 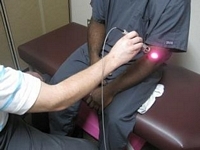 Low level laser therapies are excellent additions to any treatment plan, especially in the forearm tendons. We commonly utilize low level laser therapy for nerve entrapment or compression syndromes. There are multiple entrapment sites in the forearm, including cubital tunnel syndrome, pronator teres syndrome, carpal tunnel syndrome, De Quervain tenosynovitis, and tunnel of Guyon Syndrome. When chronic contraction of the forearm muscles produces a nerve entrapment, low level laser therapy is an excellent treatment for accelerating nerve regeneration. Many patients have responded very well to the treatment.